The Organ is used regularly throughout the year for recitals and concerts as well as for school speech day, dinners and conferences. 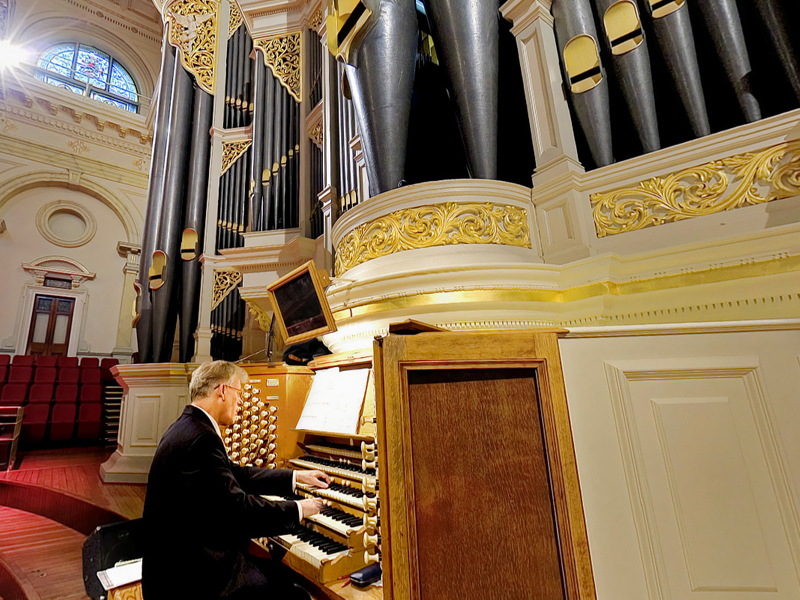 Appointed City Organist in 1978, Robert Ampt is an internationally renowned organist, who has thrilled generations of concert- goers in Sydney Town Hall with his masterful and musical renditions of much-loved classical and popular music. A dedicated organist, choirmaster, organ teacher and composer of organ and choral music, Robert is passionate about music. After receiving his graduate and post-graduate qualifications in music from the University of Adelaide, he studied at the Hochschule für Music und darstellende Kunst, Vienna with Anton Heiller (1923-1979), the celebrated Austrian organist, conductor and composer. He was founding co-editor of the organ Music Society newsletter, Artistic Director of the Adelaide Organ Week; founder and Artistic Director of the Wollongong Organ Festival and joint organiser of the 1988 Bicentennial Sydney Organ Academy. With his wife, Sydney University organist Amy Johansen, Robert has performed many organ duets in town halls across Australia and in the USA and New Zealand, and introduced thousands of children to organ music through specially chosen programs. Robert’s many accomplishments include Patron, Organ Historical Trust of Australia, past President, Organ Music Society of Sydney; organist/choirmaster, Sydney’s German Lutheran Church; organ teacher, University of Sydney; past teacher, Sydney Conservatorium of Music; Associate Composer, Australian Music Centre; feature organist Southern Grampians Promenade of Sacred Music, 2007 and feature artist at the Organs of Ballarat Goldfields Festival in 2009. A recognised authority on historical organs, Robert has acted as a consultant on organ projects including the acquisition of the new organ in the chapel of Newington College, Sydney and the restoration of the organs in Sydney Conservatorium of Music and Dunedin Town Hall, New Zealand. Robert is a frequent contributor of articles about organs to professional publications and in 1999, he published the widely acclaimed work The Sydney Town Hall Organ – William Hill and Son’s Magnus Opus. Robert Ampt is regularly featured as a performer and composer on ABC radio in programs which have included New Sydney Organs and The Improvisation of Chorale Preludes. He has produced audio recordings on the ABC Move, Woodward and Priory labels and the video recoding of Guilant’s Symphony No 1 in D minor with the SBS Youth orchestra on the Marcom label. For further information about Sydney Town Hall’s Grand Organ, consult Robert Ampt’s detailed historical survey, The Sydney Town Hall Organ: William Hill and Son’s Magnus Opus, Birralee Publishing, Woodford NSW, 1999.